Larsen's status as a Harlem Renaissance woman writer was rivaled by only Zora Neale Hurston’s. This Norton Critical Edition of her electrifying 1929 novel includes Carla Kaplan’s detailed and thought-provoking introduction, thorough explanatory annotations, and a Note on the Text. An unusually rich “Background and Contexts” section connects the novel to the historical events of the day, most notably the sensational Rhinelander/Jones case of 1925. Fourteen contemporary reviews are reprinted, including those by Alice Dunbar-Nelson, Mary Griffin, and W. E. B. Du Bois. Published accounts from 1911 to 1935―by Langston Hughes, Juanita Ellsworth, and Caleb Johnson, among others―provide a nuanced view of the contemporary cultural dimensions of race and passing, both in America and abroad. Also included are Larsen’s statements on the novel and on passing, as well as a generous selection of her letters and her central writings on “The Tragic Mulatto(a)” in American literature. Additional perspective is provided by related Harlem Renaissance works. “Criticism” provides fifteen diverse critical interpretations, including those by Mary Helen Washington, Cheryl A. Wall, Deborah E. McDowell, David L. Blackmore, Kate Baldwin, and Catherine Rottenberg. A Chronology and Selected Bibliography are also included. The heroine of Passing takes an elevator from the infernal August Chicago streets to the breezy rooftop of the heavenly Drayton Hotel, "wafted upward on a magic carpet to another world, pleasant, quiet, and strangely remote from the sizzling one that she had left below." Irene is black, but like her author, the Danish-African American Nella Larsen (a star of the 1920s to mid-1930s Harlem Renaissance and the first black woman to win a Guggenheim creative-writing award), she can "pass" in white society. Yet one woman in the tea room, "fair and golden, like a sunlit day," keeps staring at her, and eventually introduces herself as Irene's childhood friend Clare, who left their hometown 12 years before when her father died. Clare's father had been born "on the left hand"--he was the product of a legal marriage between a white man and a black woman and therefore cut off from his inheritance. So she was raised penniless by white racist relatives, and now she passes as white. Even Clare's violent white husband is in the dark about her past, though he teases her about her tan and affectionately calls her "Nig." He laughingly explains: "When we were first married, she was white as--as--well as white as a lily. But I declare she's getting darker and darker." As Larsen makes clear, Passing can also mean dying, and Clare is in peril of losing her identity and her life. First published to critical acclaim in 1929, Passing firmly established Nella Larsen's prominence among women writers of the Harlem Renaissance. 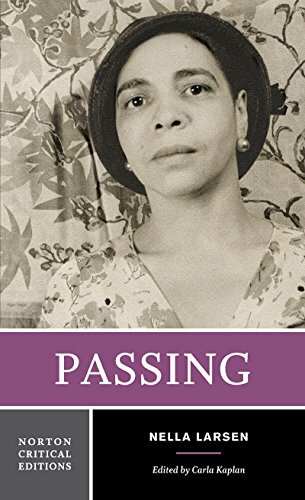 The Modern Library is proud to present Passing?an electrifying story of two women who cross the color line in 1920s New York?together with a new Introduction by the Obie Award- winning playwright and novelist Ntozake Shange. Irene Redfield, the novel's protagonist, is a woman with an enviable life. She and her husband, Brian, a prominent physician, share a comfortable Harlem town house with their sons. Her work arranging charity balls that gather Harlem's elite creates a sense of purpose and respectability for Irene. But her hold on this world begins to slip the day she encounters Clare Kendry, a childhood friend with whom she had lost touch. Clare?light-skinned, beautiful, and charming?tells Irene how, after her father's death, she left behind the black neighborhood of her adolescence and began passing for white, hiding her true identity from everyone, including her racist husband. As Clare begins inserting herself into Irene's life, Irene is thrown into a panic, terrified of the consequences of Clare's dangerous behavior. And when Clare witnesses the vibrancy and energy of the community she left behind, her burning desire to come back threatens to shatter her careful deception. Brilliantly plotted and elegantly written, Passing offers a gripping psychological portrait of emotional extremity. The New York Times Book Review called Larsen "adroit at tracing the involved processes of a mind divided against itself, that fights between the dictates of reason and desire." The Saturday Review of Literature said, "[Larsen] has produced a work so fine, sensitive, and distinguished that it rises above race categories and becomes that rare object, a good novel."